The story of Qualcomm’s Arm server product line has been full of ups and downs. On the up, last year, we saw a large disclosure on how the new Falkor core design was put together, and Qualcomm even officially launched CPU pricing. It was going to be another push for Arm cores into the datacenter. Everything looked to be on an upwards path, until early 2018, when Qualcomm was looking to consolidate some of its divisions, and it was noted that a number of key members of the Centriq team had left. The official line is that Qualcomm was still going to support the product family, however any roadmap seemed to disappear. 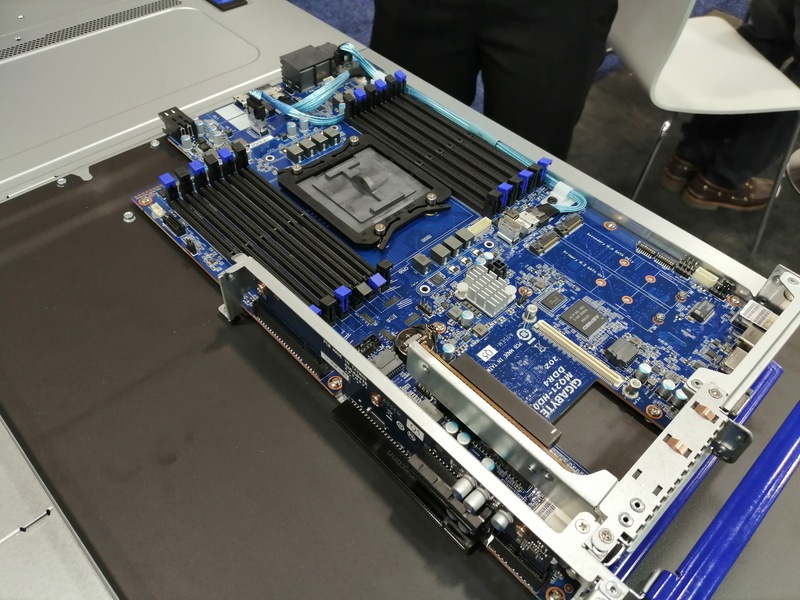 We weren’t expecting to see any Qualcomm servers at the Supercomputing show this week. 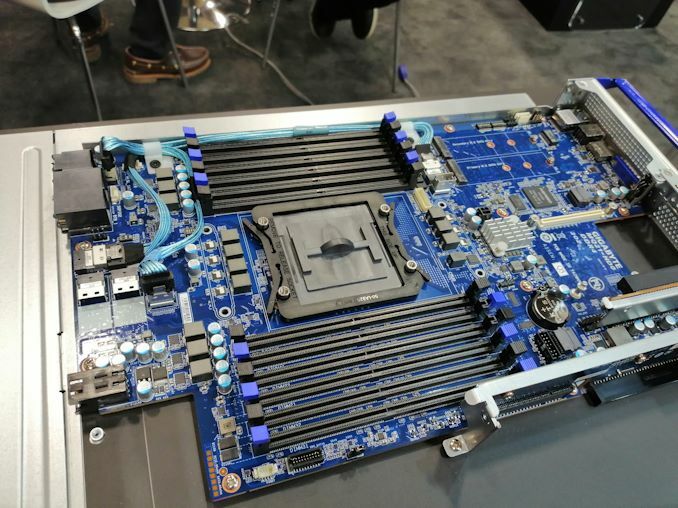 However when casually walking by the GIGABYTE server booth, they had one of the early PVT samples ready to show for customers. On display was a H221-Q20 2-node 2U server using QDF2400 (Centriq) processors. 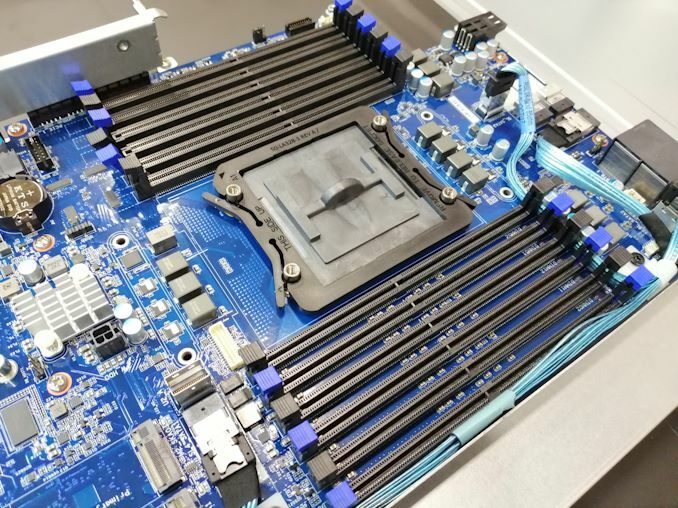 Each processor is backed with 12-channel DDR4, which takes up a large portion of the motherboard. Other available parts include 4x1Gb/s, two management ports, twelve 3.5-inch hot swap bays, four M.2 slots for SATA drives, two PCIe low profile slots, four full PCIe slots, two OCP Mezzanine slots, a BMC, and 1200W Platinum redundant PSUs. The system is still in the early stage of development. We were told to come back in the middle of next year for systems that would be ready to go. Given that Qualcomm officially launched Centriq on November 10th 2017, that would mark 18 months after launch when GIGABYTE will have systems ready. 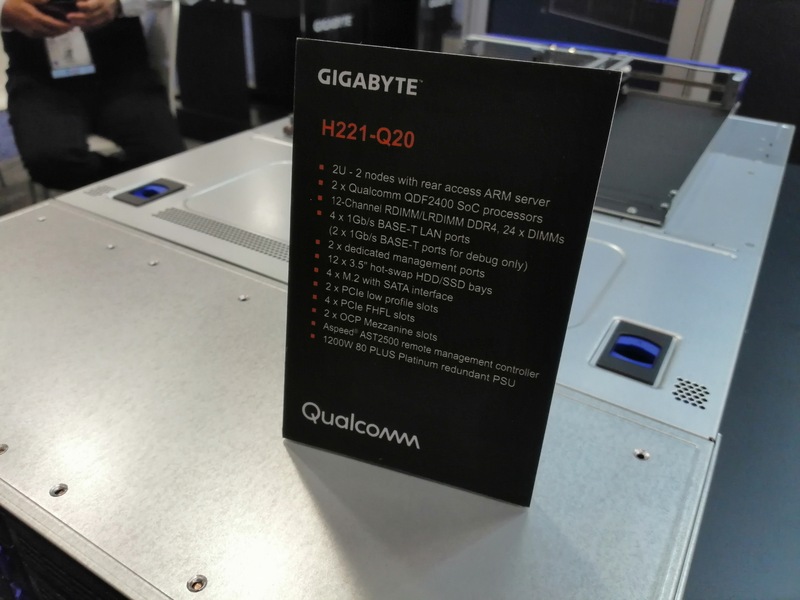 Interestingly we were told that only GIGABYTE is the only manufacturer who is allowed to sell these systems into the channel, with everyone else being an OEM. We’ve asked for one, when they’re ready to share. "On display was a H221-Q20 2-node 2U server using QDF2400 (Centriq) processors. Each processor..."
This is good news, but Qualcomm unfortunately is quite late.